The Andy Horton marine-set murder mysteries are set against the stunning vibrant backdrop of the sea in the Solent area of Portsmouth and the Isle of Wight. Horton is a man very much defined by a tormented past, but with hopes for his future. A flawed and rugged cop who doesn't conform, much to his boss's, (DCI Lorraine Bliss) chagrin. He rarely wears a suit, unless in court, and never a tie. He rides a Harley Davidson and lives alone on a small yacht in a marina in Portsmouth. He's instinctive, tough and resilient, but deeply empathetic with a dry sense of humour. His greatest strength is his ability to put himself in a victim’s shoes, to imagine events from their perspective (even the moments up to their death), making leaps of deduction few would be able to. And he’s most often right. Horton is tough on bullies, or people who abuse their power or position, as they remind him of the people in the children’s homes in which he’s been raised. When this happens, when his guard slips, he’s like a raw nerve. He fears his emotions will betray him. He feels a duty of care to the victims of the crimes he investigates and often feels like he’s the only person looking out for them; the only one who can bring the guilty to justice so that the dead can rest. No one cared about him when he was a child; he won’t let that happen to anyone else. Estranged from his wife, abandoned as a child, Horton not only seeks to solve the complex, multilayered crimes set in a vibrant and diverse coastal area but is determined to get to the truth behind his mother's disappearance thirty years ago. 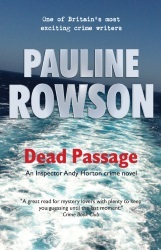 Fourteen novels published in the Detective Inspector Andy Horton series. Published in the UK and the USA and translated into several languages.